Make your own babysitter resume by downloading the sample below and using our expert writing tips. Want to save time? Try our easy-to-use resume builder! Are you young, responsible, and in need of spending money? Not surprisingly, you’re probably considering babysitting as a fast and easy way to earn a little extra cash on the side. Babysitting is a classic and timeless way for young people to earn some money. Babysitting has one other bonus: It’s a great way to kick off a lifetime of career opportunities. At this point in your life, you’re probably more interested in the spending money. However, when the time comes to write your first professional resume, you’ll be thankful for having work experience. Follow our advice to write the best babysitter resume possible. Responsibility, play, and education are critical aspects of being a good babysitter. Your skill set will determine the age range you are capable of babysitting. For instance, if you don’t know how to change a diaper, you’re automatically going to have trouble getting jobs babysitting infants and toddlers. On the other hand, if you do have these skills, you’ll become a much more versatile and stronger candidate. We’ve broken down babysitting into four major skills categories: childcare, domestic, safety, and personal. For a full explanation of how to include skills on your resume, read our article here. This category covers the major skills involved with caring directly for children. If you have these skills, include them on your resume prominently. If you don’t have these skills, you will need to learn them before attempting to take care of children. This category covers skills that you need in order to take care of the residence and ensure that the home remains neat, orderly, and clean during the parents’ absence. Often these skills are related to the ability to use household technology. This category covers skills you will need in the case of emergency, and knowledge of how to prevent emergencies and encourage safe living and playing environments. You can learn safety techniques such as CPR at the Red Cross. This category covers the personal attributes and skills you will need to effectively take care of children. Personal attributes means both emotional and physical skills. Remember, taking care of children is exhausting and requires physical strength and stamina. As you can see, the first part of the sample resume after the contact details is a short paragraph describing the applicant’s skills, abilities, and experience. It is designed to “sell” the applicant as the ideal candidate. It’s placed right at the beginning of the resume so that the reader becomes “hooked” and wants to continue reading. Normally this is called a “Career Objective,” and if you wish to make childcare your career, you are more than welcome to call it that. However, if you’re simply interested in earning some extra cash from babysitting, you can call it a Personal Statement or an Introduction. It doesn’t matter — the key thing to remember here is how to craft your statement so that it captures your readers’ interest and lands you more interviews. Let’s take a look at why the Career Objective in the sample resume above is excellent. Pay attention to the bolded parts with superscript numbers, which are explained below. 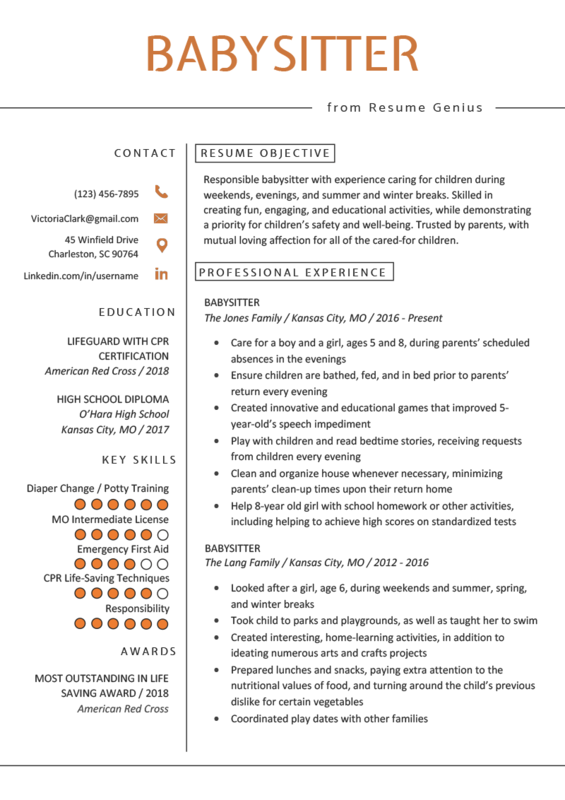 Responsible1 babysitter with experience2 caring for children during weekends, evenings, and summer and winter breaks. Skilled in creating fun, engaging, and educational activities3, while demonstrating priority in children’s safety4 and well-being. Trusted by parents5, with mutual loving affection for all cared children. Responsibility is the most critical aspect of being a good babysitter. By putting it at the very beginning, the applicant has already put the parent or guardian at ease and piqued their interest. The candidate emphasizes their past experience because it demonstrates that they’ve successfully taken care of children before, further setting the parent/guardian at ease. Fun, engaging, and educational activities are the bread and butter of taking care of children. Safety is every parent’s biggest preoccupation. Testimonials and social validation are strong indicators that the applicant is capable of taking care of children. 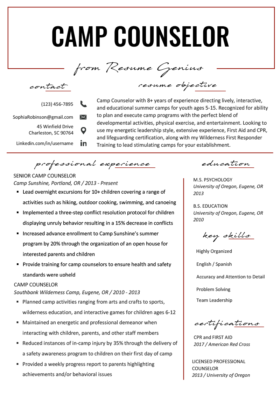 With this introductory statement, the applicant has emphasized several essential relevant skills and has undoubtedly “hooked” the parent/guardian to continue reading the resume and consider them as a serious candidate. A babysitter draws pictures with two little girls. Let’s take a look at what makes this applicant’s Professional Experience section especially strong. 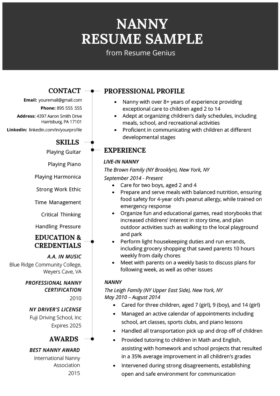 The bullet points in this resume emphasize everything from playing games, to bathing, cleaning, and feeding, and even creating games that help to improve a child’s speech impediment. Babysitting involves far more than simply watching children — it requires housekeeping, actively participating, tutoring, teaching, and playing. Make sure your resume covers as many aspects of childcare as possible. Taking care of young children is much different than taking care of older children — by giving the reader this information, you increase the clarity of your resume, and your credibility. The candidate wrote out the ages of the children they took care of because it gives the guardian/parent a better idea of their capabilities. Taking care of young children is much different than taking care of older children — by giving the reader this information, you increase the clarity of your resume, and your credibility. In this sample resume, each bullet point begins with an “action verb.” This gives the resume a sense of action and makes every sentence uniform and easy to read. Here’s the full list of action verbs from the resume. All of these action verbs are perfect for a babysitter resume, but we have a full list of every action verb in the universe if you need more suggestions. Now, the time has come for you to write your own resume. We wish you the best of luck finding employment, and some extra spending cash!